The principal aim and object of this volume is to evaluate honey and appraise its true worth, particularly as an important nutrimental and superior medicinal substance. 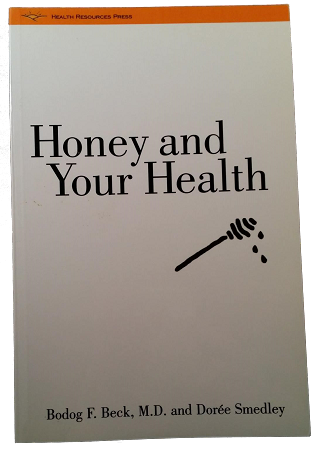 The authors venture in preparing and publishing this review during moments snatched from the hubbub of an active medical practice was inspired by a long cherished ambition to contribute his best efforts to the reinstatement of honey to its former exalted place. The advantages and efficacy of this substance should be appreciated. For someone who knows the extraordinary merits of honey, it is difficult to comprehend the reason why this salutary substance has suffered such a setback. For sixty centuries, throughout historic ages and undoubtedly even in prehistoric times, honey was man's only "sweetener" and his most favored food, delicacy and medicine. But Nature's own sweet was displaced by one of man's inferior, nay, objectionable products. Upon the intrusion of "refined" sugars, honey declined in use and now, instead of being an important household necessity, it has become an article of luxury. Civilization and even science often post only dim lights as warning signals before deep chasms, on the other hand, they neglect to mark with road-signs abandoned paths which lead to a better life.